4 step process to help you to bring the real ‘You’ to work! Do you live your personal values in the workplace? Do you bring your authentic self to work? What is my authentic self you ask? It is what makes you the person you are, when you are at your best and ‘in flow’. You are more than what other people see: I will borrow the infamous iceberg analogy to explain this. 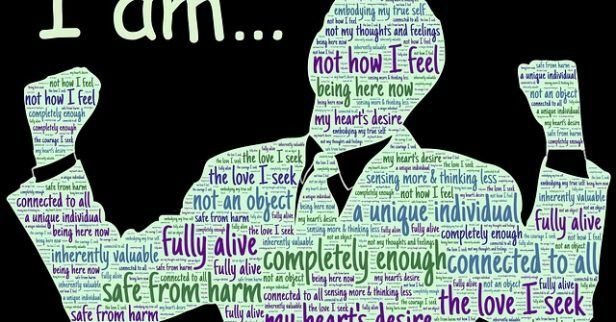 At the very core of you is your ego: the, ‘I’- ‘who I am’, your qualities, beliefs, and expressions – made up from many different things like your social and cultural influences, your up-bringing. These are principles or standards of behaviour; your judgement of what is important in life. A state or habit of mind in which trust or confidence is placed in some person or thing. Made up from everything that has shaped the life you are living, everything from your baby-hood to adult-hood. From my own experience, I know that the ‘whole you’ may not always be presented in your day-to-day workplace life. The minute you step over the threshold of Corporate-dom, you bring the intellectual, technical, efficient, conscientious, focused etc. ’You’, but leave the fun, kind, compassionate, exciting, joyful, loving, vulnerable etc. ‘You’ at the door, bought out for weekends and holidays! Does this resonate? 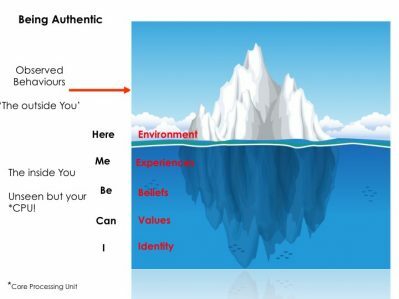 If your authentic self is not fully expressed in your workplace life, I wonder if this leads to your disengagement, lack of motivation, low morale and ultimately poor performance? Should you wish to accept it..
-Ask five colleagues to give you five words that they think describe you. From this exercise and your own observation, which ‘You’ is missing from your day-to-day life? think of ways in which you can be to be more open with colleagues about how they are feeling and how you can be of help? really listen to people, be sincere. Think about how you want to be treated and then practice this with everyone around you no matter what level they are within the organisation. think of how you can laugh more, you can have fun at work! Ensure that you inject these behaviours in everything you do, until they become just another part of who you are at work. This is interesting. I haven’t done the experiment, and I feel my work “me” was closely related to the outside Work me. I think it helped me forge strong fun relationships with colleagues and clients. Maybe this is an area other people struggle and it helped me succeed? There are aspects of the authentic me I’d like to draw on more regularly though which I believe would make life more fun and fulfilling. The ability to be less inhibited, and more willing to say no, to be unafraid of conflict which leads to more honesty and ultimately higher self esteem and confidence. Energy Management Practice – 3 tips on how to create, sustain and calm your fuel! We need a "moral operating system"